The area around Phoenix is home to many natural wonders, historical sites and parks offering an abundance of outdoor adventures. 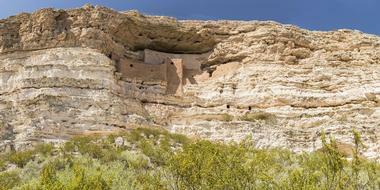 Visit Grand Canyon National Park, the Sonoran Desert, Montezuma Castle National Monument and Saguaro National Park. 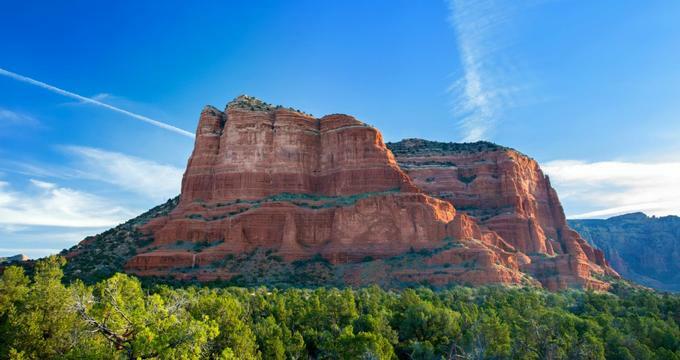 Or head to a nearby city like Sedona or Flagstaff to explore unique museums and dine at great restaurants. Sedona, Arizona, is considered by many to be one of the most beautiful places on Earth. This small town of 10,000 people is big on charm, hospitality, and natural beauty. 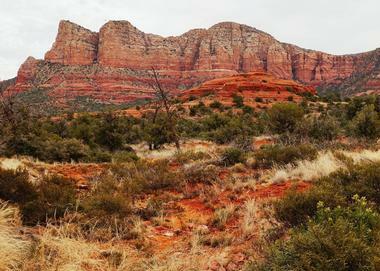 Sedona sits at the mouth of Oak Creek Canyon and is surrounded by beautiful, towering red rock formations, making it a perfect place for hiking, biking, and kayaking. 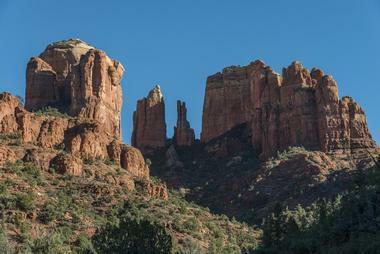 The dry, temperate climate means that the weather is almost always perfect in Sedona! The city also hosts a variety of restaurants, from classic American diners to upscale Italian cuisine. Lodging is available in cabins, hotels, bed and breakfasts, and beautiful resort properties. No other place in the world offers the breathtaking natural beauty found in Grand Canyon National Park. One of the seven Natural Wonders of the World, this national landmark is a 3.5-hour drive from Phoenix and it’s well worth the trip! The park contains miles of trails for some of the best hiking and backpacking in the country. Camping, boating, kayaking, fishing, cycling, and horseback riding are all available here, and at night it’s a great place to stargaze. Grand Canyon National Park is open 365 days a year. Special permits are required for some activities. Located 2 hours and 45 minutes from Phoenix lies a massive round depression in the ground. The depression is almost a mile across and over 500 feet deep and is known as Meteor Crater, the site where a large meteorite crashed into Earth approximately 50,000 years ago. 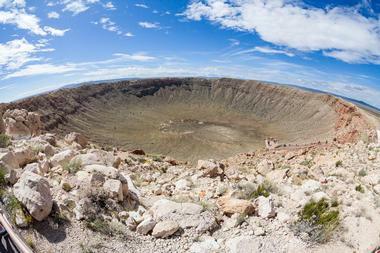 Today, Meteor Crater attracts visitors from all over the world. The on-site discovery center contains 24 interactive exhibits that give information about stars, plants, and meteors. There are also a gift shop and rock shop on the premises. Guests can take a guided or self-guided tour of the crater rim and can stay until dark for the excellent star gazing. Tucson Mountain Park is a great place to get outdoors. 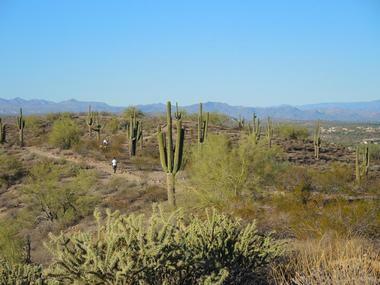 Located 1 hour and 50 minutes from Phoenix, this 20,000-acre park offers a variety of outdoor activities, including 62 miles of trails that are available for hikers, cyclists, and horseback riders. The Gilbert Ray Campground provides 130 sites with electric hook-ups for RV campers. Archery and gun shooting ranges are a part of the park, and hunting is offered in designated areas with a permit. The on-site Desert Discovery Center offers classes and workshops to teach visitors about the landscape and wildlife of the desert. In central Arizona, at an elevation of 4,500 feet, stands the Tonto Natural Bridge. At 183 feet high, it is the largest natural travertine bridge in the world. The bridge was discovered in 1877 and opened as a state park in 1991. The park contains four short trails for hiking, a visitors’ center and lodge containing museum exhibits, a gift shop, and picnic areas. Swimming is available in Pine Creek, downstream from the bridge, and special junior ranger programs are available for kids. The park is open seven days a week from 9 am to 5 pm. 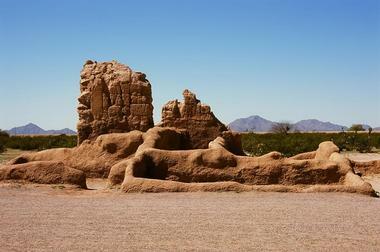 Casa Grande is one of the largest prehistoric structures in the United States. It contains a large house and a series of interconnected irrigation tunnels, ruins that were built by native desert dwellers over 600 hundred years ago. Today, the ruins stand as a national monument to the first settlers of the area. Guided tours of the ruins are offered daily, weather permitting. Special events such as guest demonstrations and the Native American Arts Festival are held throughout the year and the park also offers scouting and junior ranger programs for children. 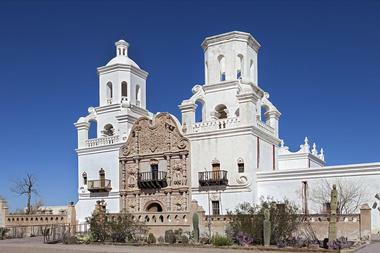 Casa Grande is open from 9 am to 5 pm daily. Saguaro Lake is a large, man-made body of water formed by the Stewart Mountain Dam. Located only 50 minutes from Phoenix, the lake is an oasis in the desert and provides a great place to cool off in the Arizona heat. 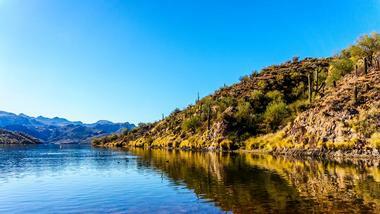 Saguaro Lake is surrounded by mountains and has 22 miles of shoreline. Boating, fishing, swimming, kayaking, skiing, and sailing are all available here. Guests can rent a boat from the Saguaro Lake Marina, then get a bite to eat at the Lakeshore Restaurant. The marina is part of the Saguaro del Note Recreation site, which also has a beach as well as picnic and restroom facilities. 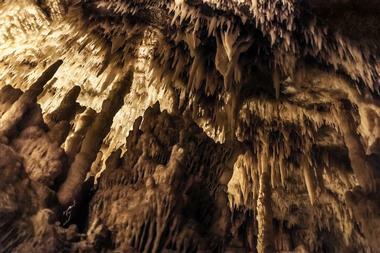 Two and a half hours away from Phoenix lies Kartchner Caverns. This large cave system contains stunning limestone formations that are considered "alive", meaning that they are still growing as water drips down into the cave. There are daily 1.5-hour guided tours of the cave, except on Christmas Day, and guests can view the beautiful stalagmites and stalactites inside. The park also contains a discovery center with displays, a gift shop, and a theater. Hiking trails, camp grounds, picnic areas, and an amphitheater can also be found at the park. 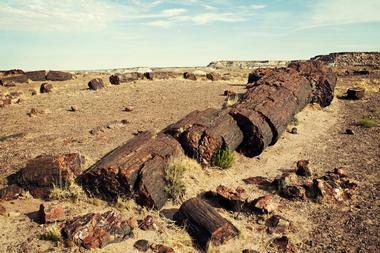 There is no park in the country like the Petrified Forest. This desert wilderness stretches for 107 square miles and sits 5,000 feet above sea level. The forest is known for fossils of plants and animals that existed in the Late Triassic Period, and special fossil extraction events are offered here for children. 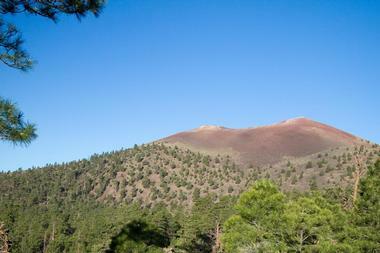 The beautiful “Painted Desert” and Rainbow Forest are also a part of the park. Guests can start their visit at the visitors’ center, which includes displays, a restaurant, and a bookstore. Guided tours and cultural demonstrations are offered daily, except on Christmas Day, and hiking, backpacking, and camping are also available here. 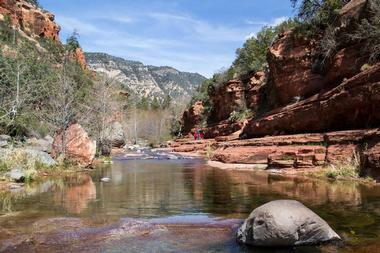 Slide Rock State Park was originally an apple farm developed by the homesteader Frank Pendley in 1910. Pendley developed an irrigation system that allowed him to plant apple trees and other produce as well as keep livestock. The slippery creek located on the homestead makes a great natural waterslide for visitors to slide on in the summertime. Today, the property stands in a state park and the sliding rock is still in use as a swimming hole. The park also contains many beautiful creeks and rock formations, hiking trails, picnic areas, a gift shop, and fishing areas. The unique geography of Arizona contains mountains, deserts, tundra, and even a volcano! At Sunset Crater Volcano National Monument, guests can drive the 34-mile loop that takes them past terrific views of the volcano as well as the ancient pueblos at Wupatki Park. Guided hikes and interpretive programs are offered through the park’s visitors’ center. Alternatively, guests can set out on their own on trails of varying lengths and difficulties, such as the Lava Flow Trail or Lennox Crater Trail. In the summer time, monthly star parties are held at the park that take advantage of the dark skies over this remote area. Ninety miles north of Phoenix, at 5,200 feet above sea level, sits the tiny town of Jerome. 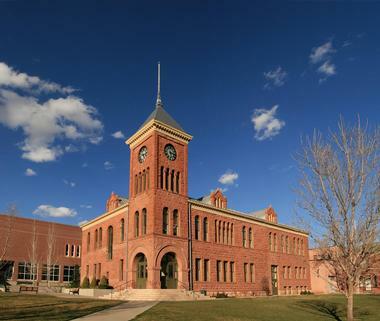 At one point in its history, Jerome was a thriving copper mining community with a population of 15,000. 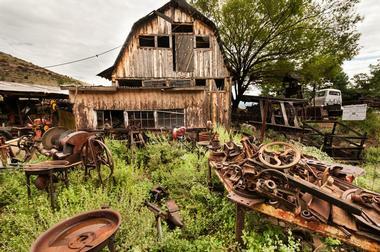 During the Great Depression, the demand for copper dropped and the community became a ghost town of only 100 people. Today, Jerome is a vibrant tourist community that is also a monument to Arizona history. Visitors will find historic buildings from the town's mining days as well as shops, restaurants, saloons, boutiques, and galleries featuring works by the town’s many local artists. Coconino is one of six national forests in the state of Arizona. This massive forest of 1.8 million acres offers a variety of beautiful mountain, desert, and forest landscapes. Visitors can drive the Oak Creek Canyon Road or Mogollon Rim Road and see beautiful colored rock formations without having to leave their cars. The more adventurous can hike along the miles of trails through the mountains and forests. Two archeological sites are also part of the forest, giving guests a look at the life of the earliest inhabitants, the Native Americans. Fishing, boating, and horseback riding are also available in the forest. Located 110 miles from Phoenix, the Red Rock Scenic Byway (State Road 179) is Arizona’s only National Scenic Byway. This 7.5-mile stretch of highway will take travelers through the Coconino National Forest and into Arizona’s beautiful Red Rocks Country. It offers amazing views of the beautiful prehistoric rock formations found here and is a byway to the towns of Oak Creek and Sedona. Along the way, guests will find hiking and biking trails, golfing, dining, shopping, galleries, and lodging. The Red Rock Scenic Byway is truly the path to fun, adventure, and breathtaking natural scenery. The Pima Air and Space Museum is dedicated to the history of flight in both the sky and the heavens. 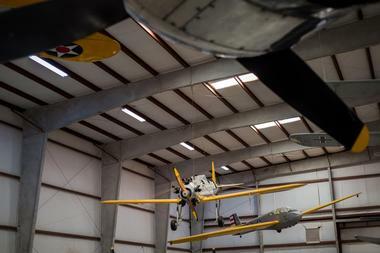 Located outside Tucson, this complex covers 80 acres and features indoor and outdoor exhibits of air and space craft. The 150 aircraft located outdoors can be viewed by walking or by a ride on the museum’s tram. There are also indoor exhibits that showcase airplanes, space vehicles, uniforms, and military history. Each Saturday, the museum holds special events for children that focus on STEM education. The museum is open 7 days a week from 9 am to 5 pm, excluding Thanksgiving Day and Christmas Day. Devil’s Bridge Trail is a 1.8-mile hiking trail of moderate difficulty located in the Coconino National Forest. The trail takes hikers to the “Devil’s Bridge”, a beautiful natural sandstone arch. The trail starts at an altitude of 4600 feet and increases slightly from there until it reaches a fork. Hikers can choose to walk downhill and stand directly under the arch, or climb all the way up to the top for breathtaking views of the Sedona red rocks. The trail can be found off Dry Creek Road and is open all year round, weather permitting. 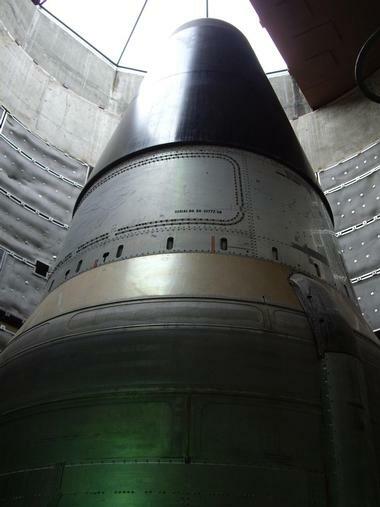 Two hours away from Phoenix stands the Titan Missile Museum. This museum is housed in the remains of a former Titan II Missile site and is the only intercontinental ballistic missile site left in the United States. Visitors can get a glimpse at a turbulent time in United States history – the Cold War. Guided tours of the missile in its silo and the launch center are offered daily. Guests can even watch a simulated missile launch. Special tours, such as a director’s tour and an in-depth “top to bottom” tour, are offered periodically. The museum also contains a souvenir store. 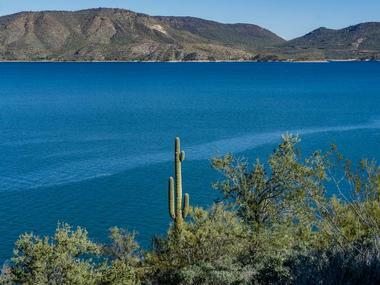 Lake Pleasant Regional Park is a 23,000-acre recreation area. It contains Lake Pleasant, a water reservoir that serves the residents of central and southern Arizona. This makes it an ideal place for water activities such as boating, fishing, skiing, swimming, and kayaking. The park is a great place for viewing native wildlife and even contains a designated area for bald eagles to nest and raise their young. The park also has picnic areas and hiking trails in varying degrees of difficulty. An onsite discovery center contains exhibits about the area’s native people, history, and wildlife. Nestled at the base of the McDowell Mountains in the Verde River basin, McDowell Mountain Regional Park is a recreational paradise. 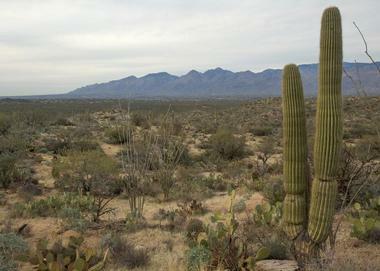 This 21,000-acre park is located 50 minutes from Phoenix. Visitors can walk, bike, or ride horses on miles of hiking trails and see spectacular views of the mountains and desert plants and wildlife. The park also offers camping and picnic areas and Arizona’s dark skies make McDowell Park a great place for stargazing! Special stargazing events are held on Saturday nights throughout the year. The park is open to visitors all year round.